I have a great interest in anything and everything that exists within the ocean, I do however have a particular fascination with cephalopods. Their uncanny ability to blend into their environment is often spectacular, through a combination of changing their skin colour and texture, they can often be hidden in plain sight, perfectly camouflaged within their habitat to avoid detection. Despite this, I still found myself somewhat surprised when I stumbled across the following video of a southern sand octopus (Octopus kaurna) disappearing into the substrate it was resting on. Using its jet to disturb the sand beneath, this octopus is able to liquefy the sediment below it, allowing it to create itself a home from which to hide in during the day, before coming out at night to forage for crustaceans to snack on. Other species of octopus have been known to bury themselves beneath the sand, these species however tend to stick close to the surface during these digs, as they still need access to the water column in order to breath. The sand octopus however, actually creates of subsurface burrow by digging deeper, using its jet and arms to submerge itself below the sand. “This is the first known cephalopod to burrow,” says Jasper Montana of the University of Melbourne. Scientists from the University of Melbourne studied the behaviour closely in the lab. As well as creating the burrow, the octopus actually sticks two of its arms out of the top of its new home which creates a sort of chimney, allowing the octopus to breathe whilst being submerged. Mucus excreted from the octopus helps to give the burrow structural rigidity and keep it from caving in. 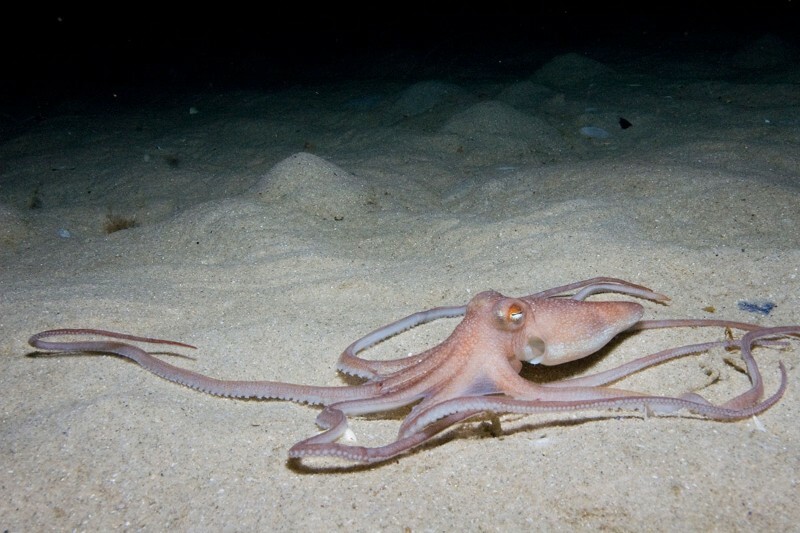 The team thinks that the behaviour evolved as a means of predator avoidance, as the sand octopus lacks the camouflage skills that many other cephalopods have. Below is a video of the sand octopus creating its home, as well as a schematic detailing the steps of the behaviour. This is kinda new for me. I didn’t know there’s this kind of Octopus. Recently I made a video & wrote a blogpost all about how apparently they aren’t colourblind after all, but detect colours in a different way to us – it completely blows my mind!